Join us at the Ferguson Public Library on the fourth Tuesday of each month for a chance to discuss and respond to this month’s featured selection! 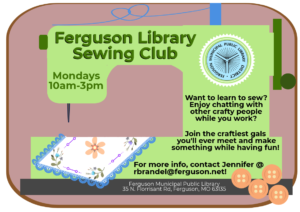 For more information about the club and this month’s selection, please contact Allison at (314) 521-4820. Check out our Research tab! Download the FREE FMPL App! Manage your account, request books, see reviews, and more! See Google Play Store for Android phones, or Apple App Store for iPhones! OverDrive for ebooks and audiobooks. Hoopla Digital for movies, music, ebooks, audiobooks, TV shows, and graphic novels. TumbleBooks for children's books, including read-aloud books, videos, and games. Vote for Ferguson’s Favorite Read! Please come to our Library Open House!